The British Splendour was carrying fifty-three men and a valuable cargo of 10,000 tons of gasoline destined for the British Isles via Halifax, NS when she was torpedoed on April 6th, 1942. She had departed Houston, Texas on March 30th, 1942 and was to meet an Eastbound Atlantic convoy in the neighborhood of Halifax. The Captain of the vessel was well aware of the dangers German U-boats posed in the Hatteras area and he had intended to pass Hatteras during daylight, but that did not occur. Shortly after 2200 hours a "buzz like an airplane motor" was heard onboard the Tanker. About ten minutes later, at 2215, a torpedo struck on the port side below the waterline, just aft of the engine room. The explosion blew off almost all of the aft superstructure and the engine room skylights. The lives of twelve men were taken in this brief instant. The life of the Splendour was also over. She immediately caught on fire then began to go down by the stern and would eventually capsize. The sinking vessel remained afloat long enough for the radioman to get off a distress message and the remaining crew of forty-one to launch three lifeboats and one raft into which they fled the sinking ship. The surviving crew were picked up by the British Armed Trawler HMS St. Zeno (FY-280) which had been escorting the Tanker at the time of the attack. Immediately after the attack, the St Zeno and the HMS Hertfordshire (FY-176) which was also escorting the tanker, launched a search for the U-boat but they were not successful. The St Zeno returned to the area of the dying Tanker and picked up the first survivors within 45 minutes and had collected them all within two hours. There were no serious injuries to the survivors and they were eventually landed at the Naval Base in Norfolk, Virginia, on April 7th. It was Oberleutnant zur See Erich Topp, of the U-552, who had torpedoed the tanker and sent her to the bottom. Oberleutnant Topp was a holder of the Ritterkreuz medal and already considered an "ace" for his actions against the British convoys in the North Atlantic and his previous cruises to the American coast off Newfoundland. He and the crew of the U-552 had just recently sunk two vessels since arriving off the American Coast. The British Splendour was his third and a total of six were lost to this U-boat commander. The U-552 (a type VII-C) survived the war and was scuttled at Wilhelmshaven, Germany, on May 2, 1945 (Lube in command). The British Splendour had been built in 1931 and was considered a very modern design being powered by two large diesel engines. She was also very big for the times, 441.2 feet long and had a beam of over 59 feet. Size went against her as the U-boats specifically targeted the large tankers and now she is upside down in 110 feet of water off Ocracoke island, many miles south of where the attack that sank her is reported to have occurred. The wreck was positively identified in 1983 by the recovery of the engine builder's plaque by diver Dave Bluett, of Virginia. The tanker sits in an area of hard sand bottom and usually has clear water over her resulting in normally good to excellent visibility. The bow and stern sections are relatively well defined with the amidships section, which contained the tanks and pumping gear, somewhat collapsed and fairly flat to the sea bottom. 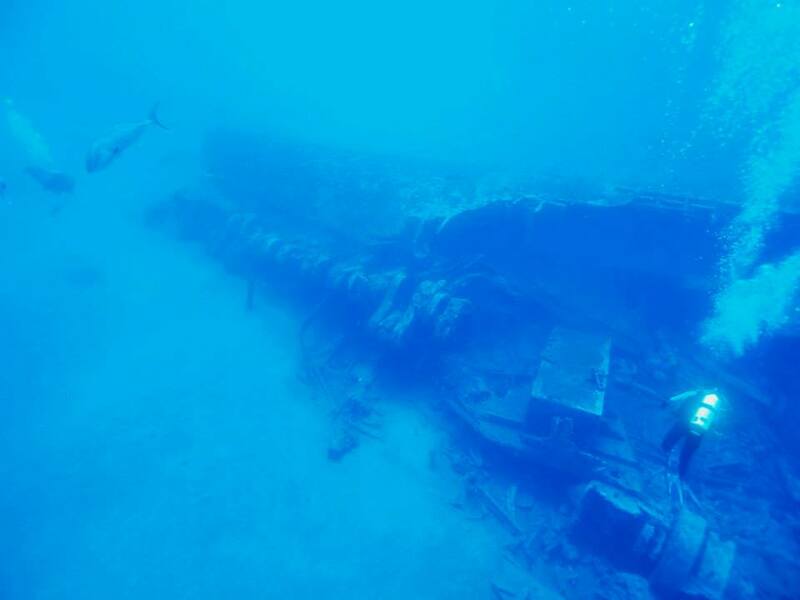 The stern, even though upside down, is generally the better dive due to the much greater relief rising to 70 feet and the presence of more artifacts there. The area hit by the torpedo is easily seen on the side of the engine room and the crankshaft of one of the engines is easily identified laying just outside the hull. The stern section is fairly easy to penetrate and swim completely through. However, extreme caution must be exercised as several pieces of machinery have fallen from the overhead and the stern is collapsing in upon itself at an increasing rate with each passing season. In the summer of 2000, a large crack opened up in the hull plating of the upside down stern, creating a split completely across the hull. 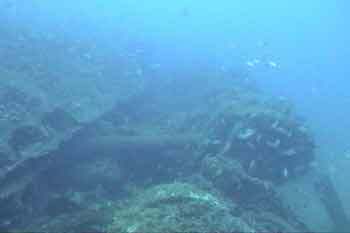 Settling of the wreck has continued to split the hull open and the crack is now about 10' wide allowing entry into the hull in both directions from the split. The ocean swell from subsequent storms have caused additional shell plating to peel back from the hull exposing the frames, webs and brackets that supported the outer shell. Several of the overhanging hull plates on the forward end of the stern section have also recently fallen. Over the winter of 2004, a section of the port side of the hull in the engine room area tore away and one of the large electric motors that was previously inside the engine room is now laying just outside the hull. The photo by diver Marc Corbett (shown below) taken Spring of 2013 shows the condition of this entire stern engine room section of the site. I recently reviewed some photos that had been taken of the British Splendour during the late 1990's and was very surprised at the significant changes that have occurred to the stern section in just this short period of time. The forward end of this section used to stand fully erect and had a very pronounced overhang from the rear most tank bulkhead. This section has completely collapsed and fallen almost flat. Storm surge has weakened the entire structure and created the previously mentioned crack across the hull and a significant amount of shell plating has torn from the wreck. The entire area of the engine room is settling at an accelerated rate and the once large opening on the port side allowing diver access to the engine room is now closed to half of the original height. Once inside the confines of the hull divers will find that the engine room, once a very dark and closed space, now has light coming in from above through the various holes and fractures in the shell and it is very easy to swim to the area of the hull crack. When we began diving this site back in the early 80's, a penetration into this space was much more dangerous as it was very dark and the entire walls were still intact so to pass forward to the section where the hull crack is today required moving down enclosed companionways and around machinery. All of this has changed and this space is much more open but at the same time becoming smaller as the overhead is collapsing. In years past, the forward end of the Splendour was not a very interesting dive as it was mainly an upside-down hull with both gunnels buried into the sand. In the recent past this has changed due to the deterioration of the structure. Now there are lots of holes in the shell plating and the same storms that have torn at the stern have opened up the bow section as well. Storm surge has scoured out the sand along the buried hull exposing areas that allow entry into the hull interior. Inside the hull which once carried oil and gasoline, is now the hiding place of thousands of fish and I see everything from little bait fish to sandtiger sharks up in there. These forward sections were all bulk oil tanks and are large open spaces divided and supported by bulkheads and the associated framing. The Splendour appears to have been a single skinned tanker as looking up in the tank spaces you can see all of the Longitudinal and Floor Frames that support the Hull shell plating and there appears to be no plating for inner tank skins. The forces of the sea are always at work and it changes these wreck sites constantly. Even relatively small Hurricane Arthur, July 2014, tore away some shell plating in the bow section and rearranged the wreck site some. There is nothing to be done to prevent this, the Ocean and gravity will eventually win; the British Splendour will totally collapse upon herself and rust away to an unrecognizable form. Hopefully, that day is still a long ways off and we can enjoy many more days of diving at this still great site. The Splendour usually holds large numbers of fish as the inside spaces of the shipwreck provide a great habitat for a large number of creatures and I have seen very large Goliath Grouper (jewfish of 300#+) lurking in the stern section as well as sharks and other large fish. There are also many eels and large numbers of bait fish inside as well. Outside, lemon sharks, large rays and turtles are seen here often. 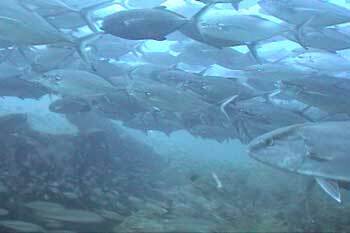 The British Splendour is consistently a great Hatteras area dive for either the novice or experienced diver. More U/W photos of the Splendour can be found on Paul Hudy's web page about the wreck. 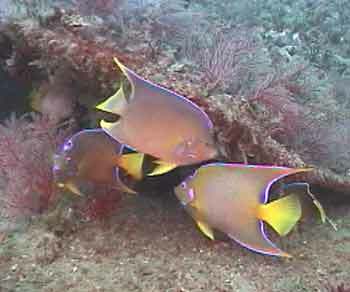 Large numbers of Tropical and huge schools of fish are common sights while diving at the British Splendour site. Send mail to webmaster@divehatteras.com with questions or comments about this web site. All Information, Content and Photos contained on the DiveHatteras web site is property of and copyright by DiveHatteras LLC, Dave and Ann Sommers, unless otherwise noted and my not be used without permission.